will be held on 15 and 16 June 2019. ​please use the contact form. For further information, please complete a contact form on this website. ​These office holders will be joined by Emma Goldfinch and Lorraine Bowman too for the new committee for 2018/19. A working bee was held at the grounds on Sunday 25th March to make a start on filling the enviro bags the club has purchased, which will be placed in the stream, to try and halt the erosion of the stream banks which are threatening the pond. It was very heartening to have members support for this project and the first 100 are now in place. More will have to be done before the winter rains are upon us so any help on this project is very much appreciated. These have now finished for the season and we are very grateful to Tony Clay for taking these days for us, we have had a lot of new handlers come along and all the dogs have progressed well. The training days have also been a major contributor to the clubs finances and a great way to catch up with other club members. Please be aware that the grounds come under the Rotorua District Council Parks regulations and apart from club days, there is no shooting or camping allowed, and please do not enter the farm next door unless authorised. The gate is kept locked to prevent vehicle access after a spate of break-ins on the next door farm accessed from our grounds. The club extends its congratulations to our president CJ Appleton who gets married on opening weekend (5th May) to Angela, we wish them all the very best for their lives together. The next major event for the club will be the Retriever Walk-Up trial on the weekend of August18/19th, this year we are including a Novice Walk-up which will be held on the Saturday so this will give new members and dogs an opportunity to have a go. The Annual Championship trial in November this year will be replaced by the North Island Championship Trial which will be held on 13th and 14th October, the week before the New Zealand’s which will be held on Labour Weekend at Horowhenua. The Annual General Meeting will be held in June, a notice will be sent to you prior. The John Gaskin Memorial Rotorua GDC P&S Game Championship was held at Equine on Saturday 23 September 2017. It was won by GFCH & GFTCH Gamemaster Tanner (Robyn Gaskin) with runner up his grand-daughter, Roshdael Bridie (Dael Russell). We will be holding one more training day for this summer’s season, it will be Saturday 22 April, I will send out a reminder close to the time. Annual General Meeting: The club’s AGM will be held on the morning of Saturday 17th June (please note change of date from 10th June), venue to be advised. This will be held on the weekend of 19/20th August, we will be holding a training day and Limit Retriever with a QC on the Saturday, an open-level walk up trial on the Sunday. Championship Trials: to be held on the weekend of 18th/19 November. We hope to see you all at these events. Here’s a bit of an update on recent club events. 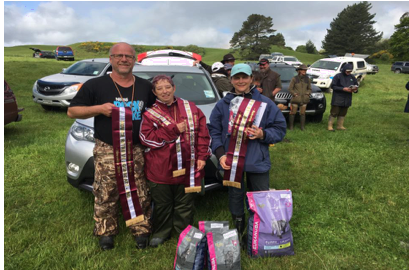 Another successful championship trial was held by the club last weekend that saw competitors come from all over New Zealand to compete; the pond was at its best and several water sections were held on it. A big thank you goes to all those who helped out over the weekend. Life Membership to the club was awarded to Tony Clay at the Championship Trial in recognition of his efforts since becoming a member. 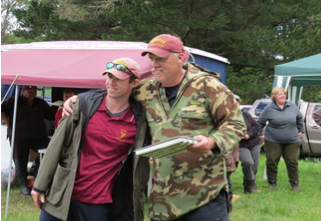 Tony has made a huge contribution to the club taking training days, running the trials, being the keeper of all the club equipment, maintaining the grounds and contributing to gun dog trialling in general, having being recently awarded star judge status by the NZGTA as well. A very well deserved Life Membership award! Training Days: The next general retriever training day will be on Sunday 18th December and we will be holding a working bee on Saturday 17th, details for both to follow. The Gary Hayes Memorial Trophy, passed to the Working Spaniel Club by the Rotorua Gun Dog Club, was won by Bob Whitehead at the Working Spaniel Club Championship Trial held at Equine on 28 August 2016. Also pictured are the 2nd and 3rd place getters, the guns' choice, Merit plus the guns and gamekeeper at Equine. Just a quick update on things that have been happening at the club recently. Walk-Up trial: this was held last weekend at the club grounds with training and a Novice retriever trial on Saturday and a Walk-up trial on Sunday. The walk up was a special day for the club as it was the first time we had been able to award a challenge point to the winner. The next training day will be in December and the Championship Trial will be held as usual in November on the weekend of the 12/13th. For further details please use the contact form. Winter greetings to all members, the weather seems to have turned to winter rain just recently so I hope you all have lots of indoor training activities planned for your dogs. Here’s a bit of an update on recent club events. We take this opportunity to thank Tony Clay for his last two years as president and welcome CJ to the role. The six executive make up our new streamlined committee and if you have any issues you would like to discuss, we are always happy to hear about them. The club is in good financial shape at present owing mostly to increased training days, and some money has been spent on buying a new rotary slasher for use at the club grounds. This will save many man hours on weed eaters in order to prepare areas for the Championship Trials courses. Walk-Up Trial: This is the next event for the club and will held on the weekend of the 20/21st August at the club grounds, we will be holding training morning and a Novice heel retrieve trial on the Saturday, the walk up trial will be held on the Sunday. We are catering both days so come down and join us, and if you can help with either trial please give Tony Clay a call. This year marks the first year Rotorua club will be awarding a challenge point for the walk up trial so is a very special first for the club. Training Days: The next general retriever training day will be on Saturday 20th August with the walk up weekend, and the winter field training series is going really well with a great turnout of field dogs coming along to the club to find out more about starting field work. Championship Trial: Our annual championship trial will be held on 12/13 November and we will be asking for help to run this trial so please keep that weekend free to come along. Training Days: the next training day will be Sunday 1st May, a flyer will be sent out to members soon. AGM: This year the Annual General Meeting will be held on Saturday 18th June at the Bluff Club, details will be sent out closer to the time. This is the time of year we can nominate life members and make any changes to the club constitution, these need to be ratified at the committee meeting prior to the AGM so contact me with anything that’s on your mind. Incorporated Societies Seminar: Last week I attended the Law Commissions Hui-E on the upcoming changes to the Incorporated Societies Act 1908; the Act is being completely reviewed and there are some important changes that will affect our club, mostly to do with our constitution which will need some significant changes to comply with the new Act which will come into law by 2020, the changes needing to be made and ratified with the Companies Office by 2018. I am planning on looking at these changes closely and will let you know which I think are the best options for our club. Our constitution was formed almost 50 years ago so a complete rethink is probably the best way to keep our club current for the future members. Slasher: Tony and Gary are still working very hard on the grounds to provide great retriever courses and are in the process of buying a slasher for the club, this will cost the club about $1250, and as we are in a good financial position at the moment is a great use of clubs accumulated funds. Up Coming Events: The walk up will be the next club trial being held over the weekend of August 20/21st, we are planning a novice retriever trial and a training day on the Saturday, with the walk up trial being held on the Sunday. We will probably cater the weekend so add it to your calendar. The Annual Championship Trial will be held in November as usual on the weekend of the 12/13th. Happy New Year to all Members! There will be no training day in January as Tony Clay is visiting Texas to attend a seminar taken by Jay (Judith) Aycock. 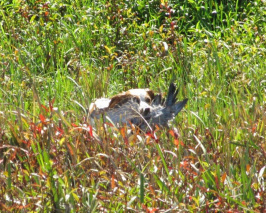 “Judy Aycock and Danny Farmer rank among the greatest retriever handlers of all-time. With more than 100 different Field Champions between the two of them, their credentials are second-to-none. ​The next training day will be Sunday 28th February, I will send out a flyer closer to the time. Club Shirts: The first order of shirts has arrived, if you missed the order and would like any club clothing, go into Speedy Signs and Embroidery in Arawa St they have our logo on file. Website: Don’t forget to look at the website from time to time, Pat has done an outstanding job on this and I think we can be very proud of our on-line presence. We have had numerous enquiries from it and as time goes on, on-line will become more and more the way to do things. Just a quick update on things happening at the club. The walk up trial was held last weekend, 22nd/23rd with a Limit QC and training day held on the Saturday, and the Simulated Walk-Up Retriever trial held on the Sunday. The training day was taken by Tahi and Graham and a big thank you goes to them for their expertise and input and congratulations to Richard Buddle with Skeinvalley Blackthorne who won the Limit trial, second and third was Katherine Murray with Glenmarric Roaring Meg and Sandford Kyla Rose, all three achieving a QC. The walk up was an exciting event, the first two legs being held at Lake Ohakuri, and the final fight for first place being held at the club grounds. The winner was Dave Murray with Glenmarric the Chadster, second place going to Arthur Appleton with Tui’s Song of Eastonpark. Well done! A big thank you to the judges Graeme and Ken, and Erin who stepped up at the last moment to take Tahi’s place when he became unwell. Life Membership: The club was very happy to award a life membership to Tina Clay for her outstanding effort and commitment to the club over the years, she has held every position and done every job in the club, and it was a great pleasure to the club to be able to make this award. Although it was ratified at the AGM, it was decided to keep it a secret and surprise her with the announcement at the walk-up prize presentation, well done Tina! November Trial: This will be held over the weekend of 14/15 November and will include Puppy, Novice, Limit and Open Retriever classes, Open Spaniel, and Novice and Open Pointer/Setter events, more details will be available closer to the date, as usual we will be needing helpers, ladies for kitchen/office duties are always welcome as are people to operate throwers and work in the field. Club Shirts: The first order of shirts has arrived, if you missed the order and would like any club clothing, let me know and I can order some more, or go into Speedy Signs and Embroidery in Arawa St and get whatever you like. Just a quick update on things to look forward to from the club. Committee: Robyn Gaskin, Frances Conner, Brent Murdoch, Shane Brannigan, Tony Day. Lorraine Bowman and Andrew Whitehead have stepped down from the committee this year and thanks go to them for the work they have done for the club. These are now available and are Maroon and white with the club logo in gold on the left lapel. They are available in women’s and men’s styles and are the same as the black/white ones we did for the North Islands a couple of years ago. The cost is $48 each across the range and the sizes are men’s: S-3xl and 5xl, ladies 8-24. The fit is a good regular fit with the ladies one being shaped, the material is dri-weave from Biz cool and the model is Flash. Email me at suewill@farmside.co.nz with your order and I am aiming to have them ordered by the end of July. The next club event will be the Walk-Up trial weekend being held on Saturday 22nd and Sunday 23rd August. We will be holding a training day and a Limit QC trial on the Saturday, a dinner and some entertainment on the Saturday night, and the Open Walk-Up trial on the Sunday, so keep that weekend free on your calendar. We will be catering the event again as it went so well last year, and Tony will need some assistance prior to the event to do some ground preparation, so don’t forget to ask him what he needs to be done, and give a hand. The Walk-Up is fast becoming a popular Retriever event and if you missed the rules when I sent them out, ask again and I can send them to you. This will be held over the weekend of 14/15 November and will include Puppy, Novice, Limit and Open Retriever classes, Open Spaniel, and Novice and Open Pointer/Setter events, more details will be available closer to the date. As usual we will be needing helpers, ladies for kitchen/office duties are always welcome, as are people to operate throwers and work in the field. These are now due as our financial year runs from 1st May to 30th April, single is $25 and family is $30. If you haven’t paid, or are not sure if you are financial, send Patricia an email at dalebrook@clear.net.nz to confirm. Don’t forget to look at the website from time to time, Pat has done an outstanding job on this and I think we can be very proud of our on-line presence. We have had numerous enquiries from it and as time goes on, on-line will become more and more the way to do things.